I received two pendants from ArtBeads.com and am showing you what I did with one of them (the other will come soon!). I was asked to choose items from their Valentine's Day selection, and my first choice was a mix of the traditional heart shape with a non-traditional black etched pattern. The shell pendant is etched in black, and I decided to work it in a Gothic fashion, with deep coral red Swarovski crystal and fringy sterling silver that I oxidized to a black patina. I love how the tiny 4mm crystals flutter from the fringe of the chain, don't you? I made a matching clasp out of oxidized sterling silver and another coral red Swarovski crystal - very simple since the chain is so elaborate. All in all, I'm a big fan of Valentine's Day, and I love hearts, but I like the non-traditional, and this piece fits the bill. Head on over to ArtBeads.com to see what else they have for Valentine's Day! Pretty! 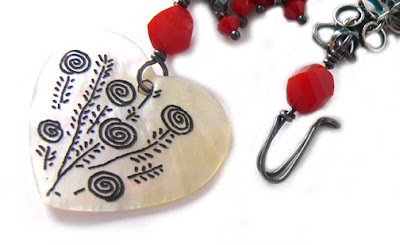 I love the etched pattern on the pendant, and the contrast of the chain and red crystals. This is a beautiful Lori, the black patina really makes the piece pop!! Love the play of the chain with the crystals and pendant. The patina on the chain and findings is a really nice contrast with the red beads and picks up nicely on the black in the pendant. What a unique heart! And you did a great job with it..... very pretty! Lori - I just love this piece! Did you make the chain as well? I've never seen one that is so 'fringy'. The heart pendant you chose is festive without being overbearingly sweet, which makes the whole piece very interesting and fun - well done! Artbeads is lucky to have you on their team! very nice Lori!! I really like the end results! 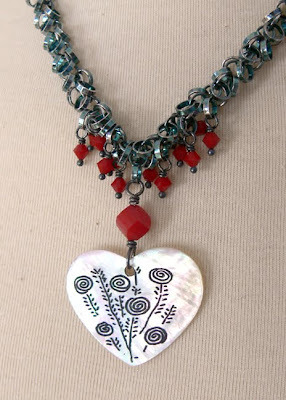 I really love the mixture of red, your smoky patina, and the silver! Wow, this truly is a stunning, non-traditional piece (in sort of a traditional way)! I like the way you think...mixing the dramatic colors and oxidized chain (and by the way, that chain is really cool too). I agree, really like those dangly crystals. Oh that looks so sweet, perfect for V Day. Love that heart and most especially what you've created with it!